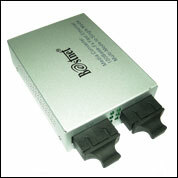 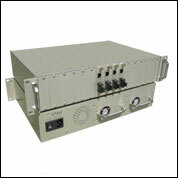 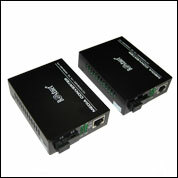 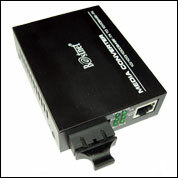 A Fiber Media Converter is a simple networking device that makes it possible to connect two dissimilar media types such as twisted pair with fiber optic cabling. 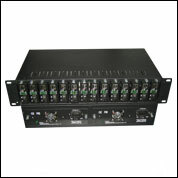 They were introduced to the industry in the 1990s, and are important in interconnecting fiber optic cabling-based systems with existing copper-based, structured cabling systems. 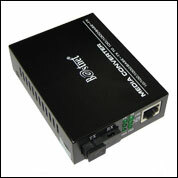 They are also used in metropolitan area network (MAN) access and data transport services to enterprise customers. 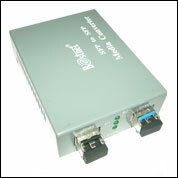 Fiber media converters support many different data communication protocols including Ethernet, Fast Ethernet, Gigabit Ethernet, T1/E1/J1, DS3/E3, as well as multiple cabling types such as coax, twisted pair, multi-mode and single-mode fiber optics. 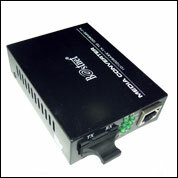 Media converter types range from small standalone devices and PC card converters to high port-density chassis systems that offer many advanced features for network management.